True or false: There’s a spider 3 feet away from you right now. 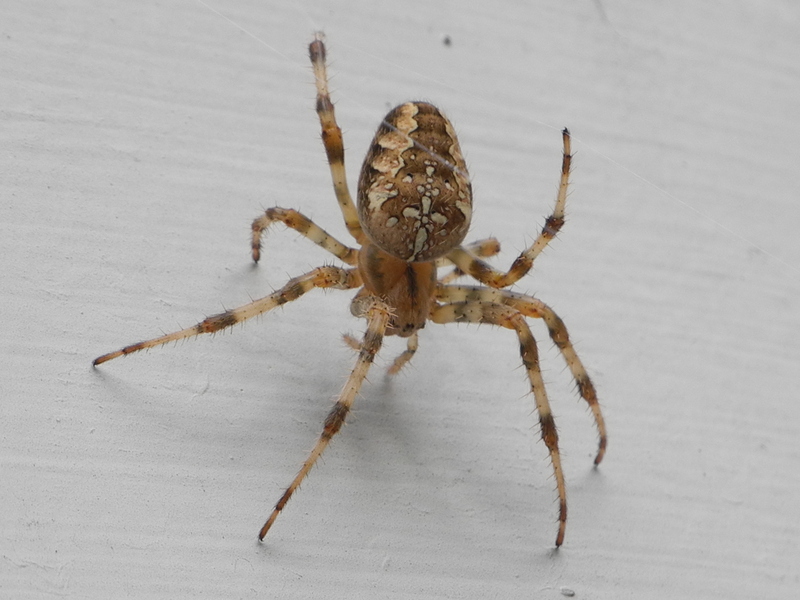 The (female) cross orbweaver spider, named for the cross on the top of her abdomen. First things first: Mark your electronic calendar for June 1! That way you won’t miss out on the Garden-wide celebration of World Environment Day. It’s a day to meet our scientists and horticulturists, to see the Daniel F. and Ada L. Rice Plant Conservation Science Center in action, and to check out senior ecologist Jim Steffen’s very cool display table on native spiders, which promises to be a kid magnet (live specimens, a big model spider, lots of good spider stories). 1. Spiders can fly. TRUE. Some spiders travel through the air by “ballooning”—sending out a thread of silk with a clump like a parachute at the end that carries them up into the air, where they swing along like Spider-Man! Spiders have been found as high as 10,000 feet in the air and 200 miles out to sea. 2. Spiders can fish. TRUE. There’s a group called fishing spiders that can capture everything from tiny water insects to fish as big as a minnow! 3. Spiders can eat their own webs. TRUE. Webs get damaged all the time, so web-weaving spiders recycle their own silk by simply re-ingesting it. (It’s full of valuable nutrients.) Then they rebuild their web—sometimes every day! 4. Spiders have two eyes. FALSE. Almost all spiders have EIGHT eyes, the better to watch their prey while holding completely still. Some spiders have two bigger eyes, like binoculars, up front so they can focus on moving prey. 5. Spiders have stingers, like Shelob in The Lord of the Rings. FALSE. Spiders inject their prey with venom through fangs at the end of their jaws, which are called chelicerae. They don’t have stingers. 6. Spiders mummy-wrap their prey, like Shelob did in The Lord of the Rings. TRUE. That’s how they keep it from escaping. A female cross orbweaver spider (Araneus diadematus) wraps a bee snack for later. 7. Daddy Long Legs are spiders. FALSE. A Daddy Long Legs isn’t a spider; although it is in the Arachnid family, it’s in a separate order from spiders. All spiders have two body segments—a thorax and an abdomen—but a Daddy Long Legs only has one round body part (and just two eyes, see #4). 8. Spider silk is always sticky. FALSE. Spiders can control the feel of the silk they produce—some is sticky, some is non-stick, some is thick and heavy, some is airy and light. 9. Scientists have identified all of the spider species. FALSE. There aren’t enough spider scientists! New spiders are being discovered all the time—in fact, our ecologist, Jim Steffen, found a sheet web-weaver last year that might be a new species! Ask him about it on World Environment Day. 10. There’s a spider 3 feet away from you right now. TRUE. But you’ll have to come to the Plant Science Center on World Environment Day to get the full story! See you June 1! Posted on May 5, 2013 January 3, 2014 Author Karen Z.Categories Ecology & Wildlife, Youth EducationTags arachnids, calendar, quiz, spiders, webs, world environment dayLeave a comment on True or false: There’s a spider 3 feet away from you right now.